It is not unusual for a company to run low on stock of certain items and be required to backorder part of a customer's order. If this happens frequently enough, a large number of order remnants can accumulate on file with backorders on each one. It can be a tedious process to access each order individually once stocks are replenished in order to change the backorders to shippable. This application provides the facility to automatically fill existing backorders for an item at a specific location. 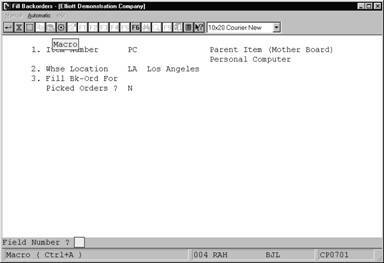 It also provides for the option of manually filling one backorder at a time, should the user opt for more control over which specific backorders are to be filled. * If you choose to manually fill one backorder at a time, you will be requested to enter the item number, warehouse location, if you wish to fill backorders for picked orders and the first order number you wish to process. The program will find that order and verify that it does contain a backorder for the item and location specified, then display information about the order. You will then be requested to enter the quantity of the back ordered amount you wish to fill. The program will update the proper amount to ship and if any new quantity still on backorder. You may then enter another order number to fill for the same item and location or you may end and start with a new item and/or location. * The program will determine whether or not there is any excess quantity on hand for that item at that location and, if there is, that amount will display near the bottom of the screen, along with the total quantity of that item backordered at that location. * If you choose to fill backorders automatically, enter the item number, warehouse location and if you wish to fill backorders for picked orders. The program will go through all the backorders, filling each complete, until there is no more excess quantity of the item available or until it runs out of backorders to fill. * For each backordered item that is filled, a record will be kept on file in the Audit Trail. This report may be accessed through Backorder Audit Trail Report application in the Reports pull down window. Enter the item number for which you wish to fill backorders. It must already exist in the In­ventory Item file. It must be controlled. Press the F7 key to search for the item by number or press the F8 key to search for the item by description. After the item number is entered, the Inventory Item file is read and the item description is automatically displayed. Enter the location code for the warehouse from which the merchan­dise on the order is to be shipped. The entry must be for that of a valid location. The location's description will dis­play beside the entry. 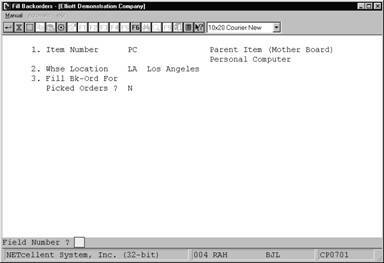 During the entry of the order number to fill, this is the location that the program will check against the actual location specified in the order. 3. Fill Bk-Ord For Picked Orders ? Enter Y to fill picked orders or N to decline. Defaults to N.
The following fields are relevant when Manually filling backorders. Press the F1 key to bring up the next valid order that has an unfilled backorder amount for this item and location, or enter the six‑digit number manually. After enter the order number, the following display fields will be shown. Enter an amount up to or equal to the back ordered quantity for this order. The amount entered cannot exceed the total excess quantity of the item on‑hand. Note that this total excess amount still available to be allocated is up­dated after each backorder is filled and is displayed near the bottom of the screen, as is the total quantity of that item still back ordered at that location. The quantity on backorder for this item. This is the quantity available for this item to fill your backorders.